We still await official confirmation of Amir Khan’s “Homecoming” opponent, for his April 21 fight in Liverpool, which will be the former 140 pound champ’s first fight in almost two full years. There are a few names in the frame, but one of the fighters who can confirm he has been approached is Canada’s Phil Lo Greco. 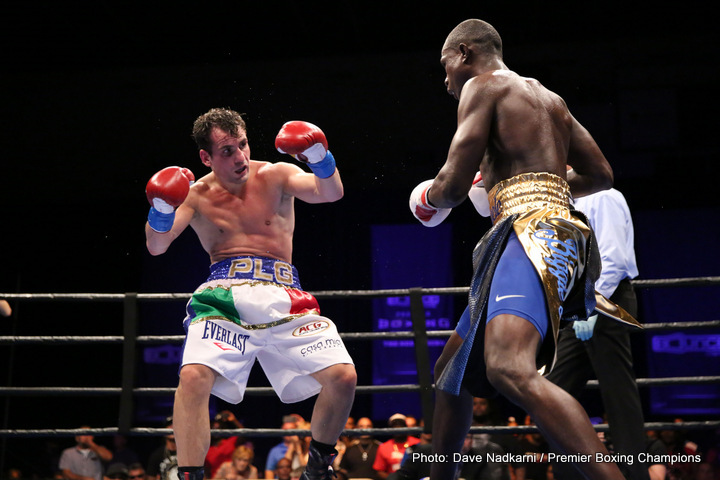 Lo Greco, 28-3(15) has faced big names like Errol Spence and Shawn Porter, losing to both top welterweights, but as much as he wants to fight Khan, he says it would be far better for him if the fight took place at 154 – ceratinly with the offer he has received from Khan’s people. Le Greco, in speaking with Sky Sports, explained his reasons two-fold: he has not been offered enough money to be willing to make the enormous efforts needed to make 147, and he wonders why Khan would want to return at 147 if he is set to face Kell Brook in a British blockbuster up at 154. Lo Greco added how he “cut corners in training” ahead of his two losses, to Spence and to Porter, but that he would not do so against Khan. It would take a big effort for him to get down to 147, Lo Greco said, and for that he would need a far better offer than the one he has been given. We await Eddie Hearn’s next move. Do he and Khan want Lo Greco for April 21, and if so, will they either up their offer or agree to box him at 154? As for whether or not Khan really wants that big domestic rumble with Brook, fans seem to have made their mind up on this already.